I had been meaning to visit this circle on many occasions, so it was a thrill to finally walk up the track to this superb monument. Another name for this embanked circle is the Druidical Circle. It was nestled amongst a pine tree plantation for many years. At the present time these trees have been cleared, so now is a good time to visit but don't leave it too long as fresh planting was in evidence. 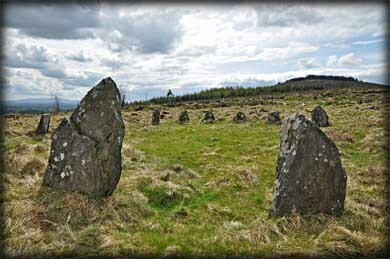 Of the original 18 stones 12 still remain upright, sadly one of these is broken. The circle is about 14 metres in diameter and a has possible winter solstice sunset. 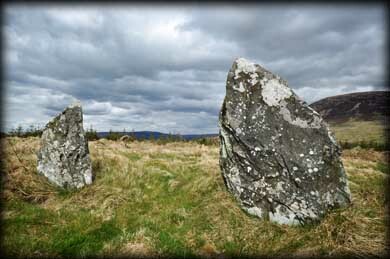 The eastern portal stone stands 1.9 metres high and the stones appear to be graded in height towards the southwest. Situated: From Baltinglass drive east on the R747 for 3k turn left. Then 600 metres at the T-Junction turn right. After 120 metres turn left. Then 2.6K take a left. After 1.5 k there is a place to park on your left. Walk up the track on the left. After about 350 metres you should see the stones protruding above the bracken about 50 metres to your right. Discovery Map 62: S 9336 8910. Last visit May 2013. 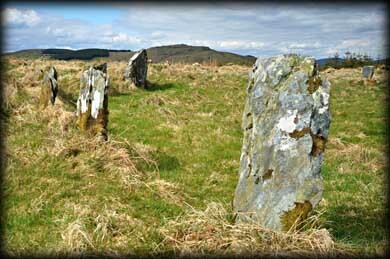 The circle stands in the shadow of Keadeen mountain with its odd markings, traditionally believed to be the figures of Fionn MacCumaill and his wife who would prepare meals on the griddle stones.